Who in their right mind would build a house without a blueprint? You need a detailed blueprint to convert the piles of building materials on your empty lot into a beautiful, finished home. If you try to build it on your own, without a blueprint, you’ll end up with a haphazard structure that will probably get knocked over by the first strong storm. Spending money with an agency or outside advisor to produce content without a strategy is quite similar to building a house without a blueprint: it’s haphazard, random and ultimately won’t help you achieve your objectives. In fact, let’s be honest... it’s a waste of your time and money. To help you design a solid blueprint for your content marketing strategy, here are the steps you need to follow for your content marketing strategy to be successful. So grab your tool belt and hard hat... let’s go! Every successful content marketing program starts with a business impact or goal. What do you want to accomplish? What impact do you want to make on your target audience? Make sure your goal is tied to one or more of your organization’s goals, or it won’t survive long in your bottom-line oriented corporate environment. A critical step in creating a content marketing strategy is to create a detailed profile of the target audience you want to influence. The detailed profile includes a description of who they are as a person, what motivates them and what challenges they face in their work. What keeps them awake at night? Create an imaginary person and give this persona a name like Bob or Judy - and write a “day in the life” description of them. Our goal is to make them as real as possible, to understand their needs at a very deep level. We call this exercise creating a persona. Buyer’s journey: It is vital to understand your target audience’s buying process (their journey). In other words, the steps they take from the time they first realize they have a need until they are ready to buy. We call that process the “buyer’s journey.” Understanding who is involved in the purchasing process, their roles and their information needs throughout the buyer’s journey helps us write content that will help them decide to buy from you. Content to be produced: Focus on your customers' needs that you have identified while creating personas and documenting the buyer’s journey. Your content should arm your audience with the knowledge and insights they need to move through the buying process quickly and efficiently. In addition to educational content, consider creating content that can be used to gently nudge or “nurture” prospects to where they are ready to buy. Also, be mindful of the formats that your target audience prefers to consume. If they favor video, then your content should be prominent on video channels where they are already gathered. For most B2B audiences, LinkedIn is a natural gathering point. Timing: Create a content calendar to outline what topics and customer pain points will be addressed each month. A documented and shared content calendar helps keep your team focused on your content strategy, and helps you take a more cohesive approach to creating and publishing your content. When you’re planning your content calendar, keep in mind any potential seasonal topics and times of year where there may be pent up demand. Create a monthly email program where you email brief teasers of your content that click thru to your website to read more. Inspire your team to share your new content on their social media channels, where it can reach a larger audience of people – and even more people who match the characteristics of your buyer personas via paid promotions. Develop your content using SEO (Search Engine Optimization) best practices to increase visibility within search engines results. This way when your customers will find you when they use google and bing to find information about your products. 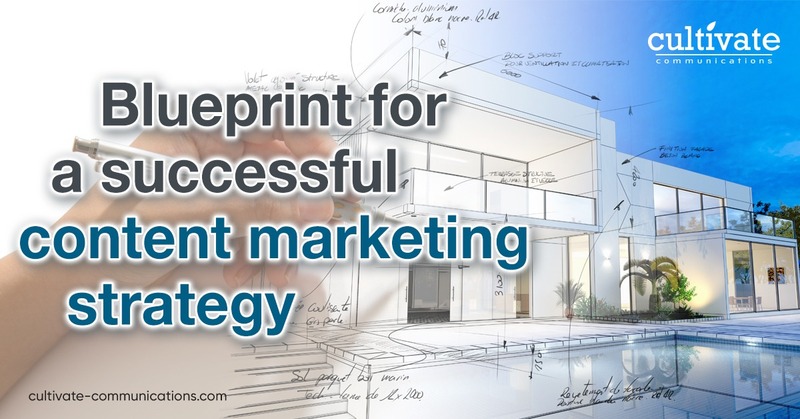 Designing a solid blueprint for your content marketing strategy leads to success. At Cultivate, we offer a free 30-minute consultation, where you will walk away with a concise understanding of how to develop a solid blueprint for your content marketing strategy. Call or email me directly for details.